Middlesex University is giddy with joy at being named a 'First Class University' by People and Planet, which compiles a league table of the UK's most sustainable universities. It is especially pleasing since we were ranked 52nd in 2013 and now we've climbed to 24th position out of 151 UK institutions. We're doing better because we've done things like installing of solar panels and LED lighting in the college buildings. 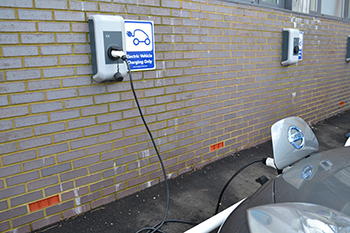 As the picture above proves, there are also now charging points for electric cars (wish they paid us enough to own one). "Four years ago we were ranked at number 111. We have come a long way since then to not only do our bit in reducing energy consumption, but we have helped improve the environment around the university, encouraging recycling and discouraging waste. "Sustainability is a top priority for the University, and to build on our success, we have developed a 'Go Green' week, encouraging all staff and students to increase their participation in our green initiatives." Alongside 'Go Green' week, Middlesex is also aiming for Eco-Campus Gold Award accreditation in 2015. We'll let you know how we do - using paperless communications, of course.